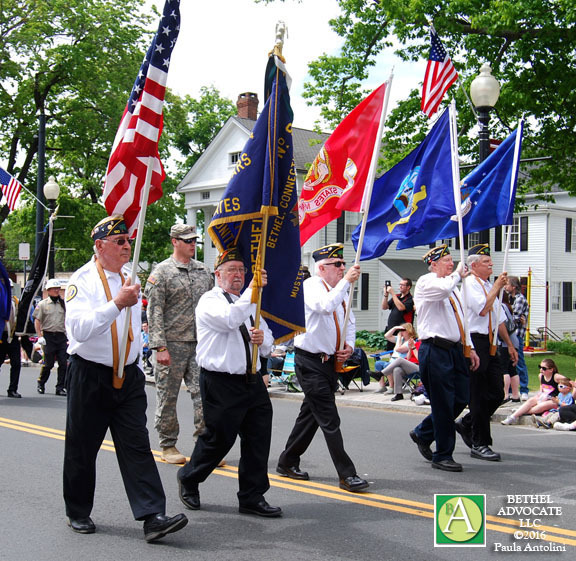 Photo above: Bethel Advocate file photo from 2016, veterans marching in Bethel Memorial Day Parade. This Sunday, May 21st, is the Bethel Memorial Day Parade which will take place at 2:00 p.m. The parade begins on Greenwood Avenue and Grassy Plain Street, winds down Greenwood, turns left at P.T. Barnum Square, left again at School Street and ends at the CJH Municipal Center, with a ceremony planned there. Wreaths will be placed at several monuments and cemeteries around town including the Spirit of the American Doughboy monument in P.T. Barnum Square, the Veterans Monument on the CJH Municipal lawn, the Soldiers’ Monument in Centre Cemetery, and other locations (see list below). Memorial Day is a day on which those who died in active military service are remembered, traditionally observed on May 30 but now officially observed on the last Monday in May. According to history.org, Memorial Day was first widely observed in May 1868. The celebration commemorated the sacrifices of the Civil War and the proclamation was made by General John A Logan. Following the proclamation, participants decorated graves of more than 20,000 Union and Confederate soldiers. In 1971, Memorial Day was declared a national holiday.